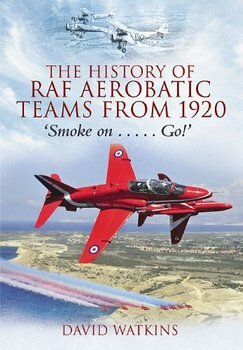 The History of RAF Aerobatic Teams From 1920: Smoke On . . . Go! Авиация / The History of RAF Aerobatic Teams From 1920: Smoke On . . . Go! Название: The History of RAF Aerobatic Teams From 1920: Smoke On . . . Go! The Royal Air Force has long recognized the value of display flying for pilot training, prestige and recruiting purposes, and the standard of its formation aerobatic teams has always stood favorable comparison with those of air forces of other nations. Aerobatics have always played a prominent part in RAF training. They are not performed merely to provide a spectacle for the public but are an essential step in the making of a pilot, giving him confidence in himself and his aircraft. Formation aerobatics give him the added factor of confidence in his leader and other members of the team. This history of RAF aerobatic teams is the result of many years of painstaking and meticulous research from its early beginnings with five Sop with Snipes at the Hendon Pageant in 1920 to the present day 'Red Arrows'. The book also contains an introduction which details the gradual development from experimental and 'stunt' flying of the early aviators, through the aerial artistry of using smoke to highlight maneuvers and tied-together formation aerobatics, to the introduction of jet teams after the war. Also included in the book is a detailed index listing each team and its members from 1920 and it will undoubtedly provide an essential reference work on Royal Air Force formation aerobatic teams for aviation historians and enthusiasts.